home » garden plants » Bulbs » New Calla Lily Cultivars/Introductions. You know you're addicted to calla lilies when...you repeatedly contact growers or distributors throughout the winter to find out when they will have their new calla lily cultivars available. Yep--that's exactly what I did; and, that's when it pays (literally) to be a good customer. 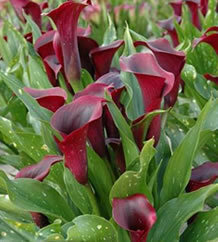 This 2010 season gave way to purchases of the following new cultivars of calla lilies: 'Rudolph' (deep, vibrant red with flaired bloom), 'Cantor' (glossy deep purple/black hue), 'Captain Maori' (deep, rich, glossy red blooms), 'Captain Murano' (unique orange burgundy with a hint of rust and contrasting yellow spathe), and 'Captain Paris' (soft and unusual eggplant burgundy). I'm fighting the urge to include 'Captain Safari' (orange/red deep, vibrant color and large, open blooms), as well. One must also ask the question: at what point is a new introduction no longer "new?" Is it based upon unit sales, how often one finds it in gardeners' yards, and/or how often the general public requests it for a bouquet or other use? I posture this question in prepartion of sharing that I also purchased one dozen corms of calla lily 'Hot Chocolate', a cultivar I started salivating over about two years ago, when I first discovered saw a picture of its dark beauty splashed on my computer screen. Some vendors are still labelling it as "NEW," and it automatically creates a sense of "must have" urgency deep within me. While some cultivars fade from "new intro" to "new" to mainstream status, they shall always have a place in my garden...but only after I've decided how much the new calla lily introductions are going to cost me. Hey, Lilylover! How are your Callas doing?! Lilylover, these are gorgeous! I really enjoy the variety of colors and the pretty way the blooms alway look like they&#x27;re still just opening. This is a wonderful collection! Thank you for the compliment, Lily; it really means a lot to me. hey LL- sounds like you are vendor&#x27;s dream come true!! I LOVE the &#x27;Hot Chocolate&#x27; calla sooo very much. Cannot get enough of dark flowers in the garden. Where do you buy your callas from..? Hi FigTree--I have a few sources for calla lily corms. Pacific Callas (http://www.callalilyshop.pacificcallas.com/allvarieties.htm) was the first online store I turned to in early 2009; and I was pleased with their high quality and customer service. I placed another order with them in December for immediate shipment and received another set of high quality bulbs (lots of eyes on the corms) and they chucked in a bonus one this time, too. YAY! My most recent addition of 2010 new calla lily introductions have been purchased from Pacific Callas as well, and they are due to ship in March. When I finally decided to purchase 'hot chocolate' calla lilies, Pacific Callas was out of them, so I opted to try another source: Oregon Coastal Flowers (http://www.flowersbulbs.com/Calla-Lily-Bulbs-C2.aspx). They said that they would not run out of them because they just go out to their fields to dig up the corms. Please note that I was not told what size corms that they would be. For other colored hybrids, customers are given the choice of selecting the bulb size, which changes their respective prices. When I get the bulbs I'll be sure to follow up accordingly. Another vendor I tried for the first time (without any guarantee of bulb size) is American Meadows (AmericanMeadows.com). I took advantage of their phenomenal pre-season sale and was able to purchase some calla lily corms for about 1/2 the price of competitors. Majestic Red and Black Forest were the varietals I selected form this vendor. If the bulb sizes are the same size as Pacific Callas and for 1/2 the price, then I may go with American Meadows again, next December. So far, though, Pacific Callas is the one calla lily corm source that I can positively say I am highly satisfied with their products, offerings, and customer service. My gosh!!! Thank you for all the info!